The term "von Neumann architecture" has evolved to mean any stored-program computer in which an instruction fetch and a data operation cannot occur at the same time because they share a common bus. This is referred to as the von Neumann bottleneck and often limits the performance of the system. Some high level languages leverage the von Neumann architecture by providing an abstract, machine-independent way to manipulate executable code at runtime (e.g., LISP), or by using runtime information to tune just-in-time compilation (e.g. languages hosted on the Java virtual machine, or languages embedded in web browsers). Von Neumann was involved in the Manhattan Project at the Los Alamos National Laboratory, which required huge amounts of calculation. This drew him to the ENIAC project, during the summer of 1944. There he joined the ongoing discussions on the design of this stored-program computer, the EDVAC. As part of that group, he wrote up a description titled First Draft of a Report on the EDVAC based on the work of Eckert and Mauchly. It was unfinished when his colleague Herman Goldstine circulated it with only von Neumann's name on it, to the consternation of Eckert and Mauchly. The paper was read by dozens of von Neumann's colleagues in America and Europe, and influenced the next round of computer designs. I know that in or about 1943 or '44 von Neumann was well aware of the fundamental importance of Turing's paper of 1936… Von Neumann introduced me to that paper and at his urging I studied it with care. Many people have acclaimed von Neumann as the "father of the computer" (in a modern sense of the term) but I am sure that he would never have made that mistake himself. He might well be called the midwife, perhaps, but he firmly emphasized to me, and to others I am sure, that the fundamental conception is owing to Turing— in so far as not anticipated by Babbage… Both Turing and von Neumann, of course, also made substantial contributions to the "reduction to practice" of these concepts but I would not regard these as comparable in importance with the introduction and explication of the concept of a computer able to store in its memory its program of activities and of modifying that program in the course of these activities. As of 1996, a database benchmark study found that three out of four CPU cycles were spent waiting for memory. Researchers expect that increasing the number of simultaneous instruction streams with multithreading or single-chip multiprocessing will make this bottleneck even worse. In the context of multi-core processors, additional overhead is required to maintain cache coherence between processors and threads. ^ Lukoff, Herman (1979). From Dits to Bits: A personal history of the electronic computer. Portland, Oregon, USA: Robotics Press. ISBN 0-89661-002-0. LCCN 79-90567. ^ ENIAC project administrator Grist Brainerd's December 1943 progress report for the first period of the ENIAC's development implicitly proposed the stored program concept (while simultaneously rejecting its implementation in the ENIAC) by stating that "in order to have the simplest project and not to complicate matters," the ENIAC would be constructed without any "automatic regulation.". ^ "Electronic Computer Project". Institute for Advanced Study. Retrieved 2011-05-26. ^ a b Campbell-Kelly, Martin (April 1982). "The Development of Computer Programming in Britain (1945 to 1955)". IEEE Annals of the History of Computing. 4 (2): 121–139. doi:10.1109/MAHC.1982.10016. ^ Lavington, Simon, ed. (2012). Alan Turing and his Contemporaries: Building the World's First Computers. London: British Computer Society. p. 61. ISBN 9781906124908. ^ Johnson, Roger (April 2008). "School of Computer Science & Information Systems: A Short History" (PDF). Birkbeck College. University of London. Retrieved 2017-07-23. ^ Backus, John W. "Can Programming Be Liberated from the von Neumann Style? A Functional Style and Its Algebra of Programs". doi:10.1145/359576.359579. ^ Dijkstra, Edsger W. "E. W. Dijkstra Archive: A review of the 1977 Turing Award Lecture". Retrieved 2008-07-11. A cognitive computer combines artificial intelligence and machine-learning algorithms, in an approach which attempts to reproduce the behaviour of the human brain. It generally adopts a Neuromorphic engineering approach. An example of a cognitive computer implemented by using neural networks and deep learning is provided by the IBM company's Watson machine. A subsequent development by IBM is the TrueNorth microchip architecture, which is designed to be closer in structure to the human brain than the von Neumann architecture used in conventional computers. In 2017 Intel announced its own version of a cognitive chip in "Loihi", which will be available to university and research labs in 2018. A Content Addressable Parallel Processor (CAPP) is a type of parallel processor which uses content-addressing memory (CAM) principles. CAPPs are intended for bulk computation. The syntactic structure of their computing algorithm are simple, whereas the number of concurrent processes may be very large, only limited by the number of locations in the CAM. The best-known CAPP may be STARAN, completed in 1972; several similar systems were later built in other countries. A CAPP is distinctly different from a Von Neumann architecture or classical computer that stores data in cells addressed individually by numeric address. The CAPP executes a stream of instructions that address memory based on the content (stored values) of the memory cells. As a parallel processor, it acts on all of the cells containing that content at once. The content of all matching cells can be changed simultaneously. A typical CAPP might consist of an array of content-addressable memory of fixed word length, a sequential instruction store, and a general purpose computer of the Von Neumann architecture that is used to interface peripherals. The control unit (CU) is a component of a computer's central processing unit (CPU) that directs the operation of the processor. It tells the computer's memory, arithmetic and logic unit and input and output devices how to respond to the instructions that have been sent to the processor.It directs the operation of the other units by providing timing and control signals. Most computer resources are managed by the CU. It directs the flow of data between the CPU and the other devices. John von Neumann included the control unit as part of the von Neumann architecture. In modern computer designs, the control unit is typically an internal part of the CPU with its overall role and operation unchanged since its introduction. Dataflow architecture is a computer architecture that directly contrasts the traditional von Neumann architecture or control flow architecture. Dataflow architectures do not have a program counter (in concept): the executability and execution of instructions is solely determined based on the availability of input arguments to the instructions, so that the order of instruction execution is unpredictable, i.e. behavior is nondeterministic. Although no commercially successful general-purpose computer hardware has used a dataflow architecture, it has been successfully implemented in specialized hardware such as in digital signal processing, network routing, graphics processing, telemetry, and more recently in data warehousing. It is also very relevant in many software architectures today including database engine designs and parallel computing frameworks.Synchronous dataflow architectures tune to match the workload presented by real-time data path applications such as wire speed packet forwarding. Dataflow architectures that are deterministic in nature enable programmers to manage complex tasks such as processor load balancing, synchronization and accesses to common resources.Meanwhile, there is a clash of terminology, since the term dataflow is used for a subarea of parallel programming: for dataflow programming. The First Draft of a Report on the EDVAC (commonly shortened to First Draft) is an incomplete 101-page document written by John von Neumann and distributed on June 30, 1945 by Herman Goldstine, security officer on the classified ENIAC project. It contains the first published description of the logical design of a computer using the stored-program concept, which has controversially come to be known as the von Neumann architecture. The 68HC08 (HC08 in short) is a broad family of 8-bit microcontrollers from Freescale Semiconductor (formerly Motorola Semiconductor). HC08's are fully code-compatible with their predecessors, the Motorola 68HC05. Like all Motorola processors that share lineage from the 6800, they use the von Neumann architecture as well as memory-mapped I/O. This family has five CPU registers that are not part of the memory. One 8-bit accumulator A, a 16-bit index register H:X, a 16-bit stack pointer SP, a 16-bit program counter PC, and an 8-bit condition code register CCR. Some instructions refer to the different bytes in the H:X index register independently. Among the HC08's there are dozens of processor families, each targeted to different embedded applications. Features and capabilities vary widely, from 8 to 64-pin processors, from LIN connectivity to USB 1.1. A typical and general purpose device from the HC08 family of units is the microcontroller M68HC908GP32. The Freescale RS08 core is a simplified, "reduced-resource" version of the HC08. The Freescale HCS08 core is the next generation of the same processors. The RS08  core is a reduced-resource version of the Freescale MC68HCS08 central processing unit (CPU), a member of the 6800 microprocessor family. It has been implemented in several microcontroller devices for embedded systems. Compared to its sibling HC08 and Freescale S08 parts, it has a much-simplified design. The 'R' in its part numbers suggests "Reduced"; Freescale itself describes the core as "ultra-low-end". Typical implementations include fewer on-board peripherals and memory resources, have smaller packages (the smallest is the QFN6 package, at 3mm x 3mm x 1mm), and are priced under US $1. Aims of the simplified design include greater efficiency, greater cost-effectiveness for small-memory-size parts, and smaller die size. The RS08 employs a von Neumann architecture with shared program and data bus; executing instructions from within data memory is possible. The device is not binary compatible with the S08 core, though the instruction opcodes and addressing modes are a subset of the S08. This allows an easy transition from the S08 core to the RS08 core for designers and engineers. Short and Tiny addressing modes allow for more efficient access and manipulation of the most-commonly-used variables and registers. These instructions have single-byte instruction opcodes, reducing the amount of program memory required by their frequent use. Die size is 30% smaller than the S08 core. The RS08 core uses the same bus structure as S08, making memory and peripheral module reuse possible. It offers a Background Debug Mode interface, a single-wire debugging interface that allows interactive control over the processor when installed in a target system. The Harvard architecture is a computer architecture with physically separate storage and signal pathways for instructions and data. The term originated from the Harvard Mark I relay-based computer, which stored instructions on punched tape (24 bits wide) and data in electro-mechanical counters. These early machines had data storage entirely contained within the central processing unit, and provided no access to the instruction storage as data. Programs needed to be loaded by an operator; the processor could not initialize itself. Today, most processors implement such separate signal pathways for performance reasons, but actually implement a modified Harvard architecture, so they can support tasks like loading a program from disk storage as data and then executing it. The history of computer science began long before our modern discipline of computer science usually appearing in forms like mathematics or physics. Developments in previous centuries alluded to the discipline that we now know as computer science. This progression, from mechanical inventions and mathematical theories towards modern computer concepts and machines, led to the development of a major academic field, massive technological advancement across Western Society, and the basis of a massive worldwide trade and culture. The IAS machine was the first electronic computer to be built at the Institute for Advanced Study (IAS) in Princeton, New Jersey. It is sometimes called the von Neumann machine, since the paper describing its design was edited by John von Neumann, a mathematics professor at both Princeton University and IAS. The computer was built from late 1945 until 1951 under his direction. The general organization is called Von Neumann architecture, even though it was both conceived and implemented by others. The computer is in the collection of the Smithsonian National Museum of American History but is not currently on display. The project was the brainchild of Ralph Meagher and Abraham H. Taub, who both were associated with Princeton's Institute for Advanced Study before coming to the University of Illinois. The ILLIAC I became operational on September 1, 1952. It was the second of two identical computers, the first of which was ORDVAC, also built at the University of Illinois. These two machines were the first pair of machines to run the same instruction set. ILLIAC I was based on the IAS Von Neumann architecture as described by mathematician John von Neumann in his influential First Draft of a Report on the EDVAC. Unlike most computers of its era, the ILLIAC I and ORDVAC computers were twin copies of the same design, with software compatibility. The computer had 2,800 vacuum tubes, measured 10 ft (3 m) by 2 ft (0.6 m) by 8½ ft (2.6 m) (L×B×H), and weighed 4,000 pounds (2.0 short tons; 1.8 t). ILLIAC I was very powerful for its time; in 1956 it had more computing power than all of Bell Labs. Because the lifetime of the tubes within ILLIAC was about a year, the machine was shut down every day for "preventive maintenance" when older vacuum tubes would be replaced in order to increase reliability. Visiting scholars from Japan assisted in the design of the ILLIAC series of computers, and later developed the MUSASINO-1 computer in Japan. ILLIAC I was retired in 1962, when the ILLIAC II became operational. The MANIAC (Mathematical Analyzer, Numerical Integrator, and Computer or Mathematical Analyzer, Numerator, Integrator, and Computer) was an early computer built under the direction of Nicholas Metropolis at the Los Alamos Scientific Laboratory. It was based on the von Neumann architecture of the IAS, developed by John von Neumann. As with all computers of its era, it was a one-of-a-kind machine that could not exchange programs with other computers (even other IAS machines). Metropolis chose the name MANIAC in the hope of stopping the rash of silly acronyms for machine names, although von Neumann may have suggested the name to him. The MANIAC weighed about 1,000 pounds (0.50 short tons; 0.45 t).The first task assigned to the Los Alamos Maniac was to perform more exact and extensive calculations of the thermonuclear process.The MANIAC ran successfully in March 1952 and was shut down on July 15, 1958. However, it was apparently transferred to the University of New Mexico until it was retired in 1965. It was succeeded by MANIAC II in 1957. A third version MANIAC III was built at the Institute for Computer Research at the University of Chicago in 1964. A computer named MANIAC I was featured in the science fiction film The Magnetic Monster, although this was not the actual chassis of MANIAC I. The modified Harvard architecture is a variation of the Harvard computer architecture that allows the contents of the instruction memory to be accessed as if it were data. Most modern computers that are documented as Harvard architecture are, in fact, modified Harvard architecture. The 68HC05 (HC05 in short) is a broad family of 8-bit microcontrollers from Freescale Semiconductor (formerly Motorola Semiconductor). Like all Motorola processors that share lineage from the 6800, they use the von Neumann architecture as well as memory-mapped I/O. This family has five CPU registers that are not part of the memory: an 8-bit accumulator A, an 8-bit index register X, an 8-bit stack pointer SP with two most significant bits hardwired to 1, a 13-bit program counter PC, and an 8-bit condition code register CCR. Among the HC05's there are several processor families, each targeted to different embedded applications. The 68HC05 family broke ground with the introduction of the EEPROM-based MC68HC805C4 and MC68HC805B6 variants in the late 1980s. Using a serial bootloader, they could be programmed in-circuit with simple software running on a PC and a low current 19V supply (no programmer required). The HC05 series is now considered legacy and is replaced by the HC(S)08 MCU series. The ORDVAC or Ordnance Discrete Variable Automatic Computer, an early computer built by the University of Illinois for the Ballistic Research Laboratory at Aberdeen Proving Ground, was based on the IAS architecture developed by John von Neumann, which came to be known as the von Neumann architecture. The ORDVAC was the first computer to have a compiler. ORDVAC passed its acceptance tests on March 6, 1952 at Aberdeen Proving Ground in Maryland. Its purpose was to perform ballistic trajectory calculations for the US Military. In 1992, the Ballistic Research Laboratory became a part of the US Army Research Laboratory. Unlike the other computers of its era, the ORDVAC and ILLIAC I were twins and could exchange programs with each other. The later SILLIAC computer was a copy of the ORDVAC/ILLIAC series. J. P. Nash of the University of Illinois was a developer of both the ORDVAC and of the university's own identical copy, the ILLIAC, which was later renamed the ILLIAC I. Abe Taub, Sylvian Ray, and Donald B. Gillies assisted in the checkout of ORDVAC at Aberdeen Proving Ground. After ORDVAC was moved to Aberdeen, it was used remotely by telephone by the University of Illinois for up to eight hours per night. It was one of the first computers to be used remotely and probably the first to routinely be used remotely. The ORDVAC used 2178 vacuum tubes. Its addition time was 72 microseconds and the multiplication time was 732 microseconds. Its main memory consisted of 1024 words of 40 bits each, stored using Williams tubes. It was a rare asynchronous machine, meaning that there was no central clock regulating the timing of the instructions. One instruction started executing when the previous one finished. One of the ORDVAC programmers was Elsie Shutt. ORDVAC and its successor at Aberdeen Proving Ground, BRLESC, used their own unique notation for hexadecimal numbers. Instead of the sequence A B C D E F universally used today, the digits ten to fifteen were represented by the letters K S N J F L (King Sized Numbers Just for Laughs), corresponding to the teleprinter characters on five-track paper tape. 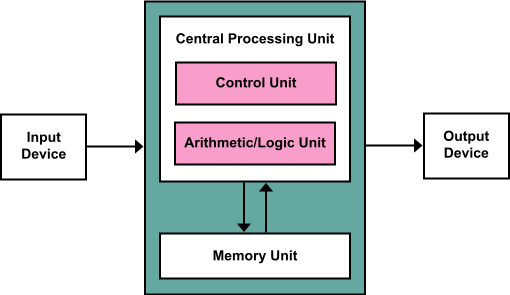 In computing, SISD (single instruction stream, single data stream) is a computer architecture in which a single uni-core processor, executes a single instruction stream, to operate on data stored in a single memory. This corresponds to the von Neumann architecture. SISD is one of the four main classifications as defined in Flynn's taxonomy. In this system, classifications are based upon the number of concurrent instructions and data streams present in the computer architecture. According to Michael J. Flynn, SISD can have concurrent processing characteristics. Pipelined processors and superscalar processors are common examples found in most modern SISD computers.Instructions are sent to the control unit from the Memory Module and are decoded and sent to the processing unit which processes on the data retrieved from Memory module and sents back to it. TrueNorth is a neuromorphic CMOS integrated circuit produced by IBM in 2014. It is a manycore processor network on a chip design, with 4096 cores, each one having 256 programmable simulated neurons for a total of just over a million neurons. In turn, each neuron has 256 programmable "synapses" that convey the signals between them. Hence, the total number of programmable synapses is just over 268 million (228). Its basic transistor count is 5.4 billion. Since memory, computation, and communication are handled in each of the 4096 neurosynaptic cores, TrueNorth circumvents the von-Neumann-architecture bottleneck and is very energy-efficient, with IBM claiming a power consumption of 70 milliwatts and a power density that is 1/10,000th of conventional microprocessors. The SyNAPSE chip operates at lower temperatures and power because it only draws power necessary for computation.